It is a testament to the design of the Cape Cutter that it sails well with two reefs. And that was just as well, because today was much windier that we had so far experienced this week. We have been very lucky with the weather; the night in RHYC berths had been very peaceful, but the wind built up during the morning and was already topping the 20kt gusts which had been forecast. 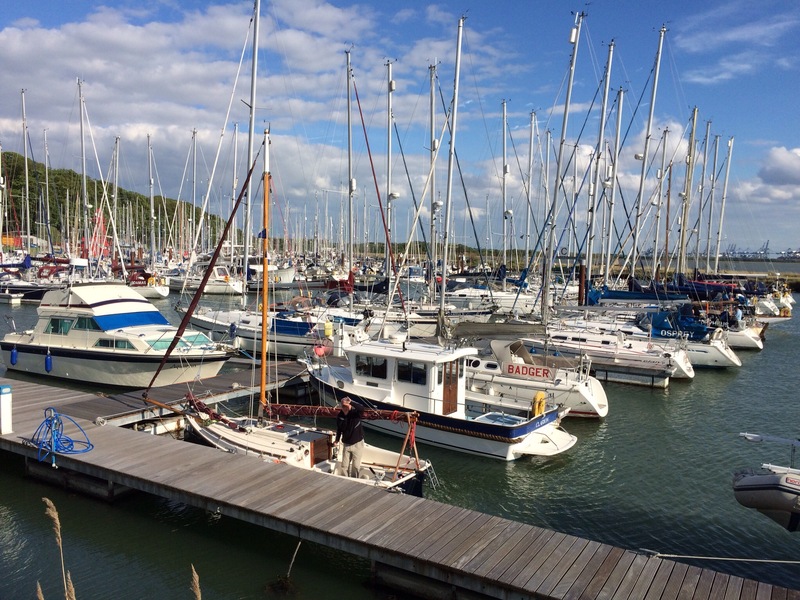 Several boats decided to stay in the Orwell, given the conditions, but five boats chose to cross out of the river mouth and into the Walton Backwaters, to stay at Titchmarsh marina. 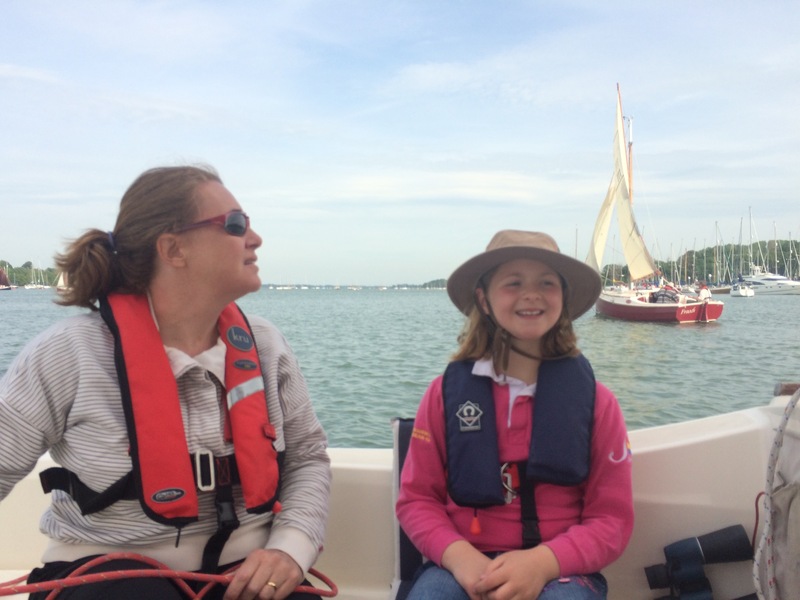 Three of the boats were single handed (myself included, as the girls had all gone to the Suffolk Show) and we set off down the Orwell with staysail only. 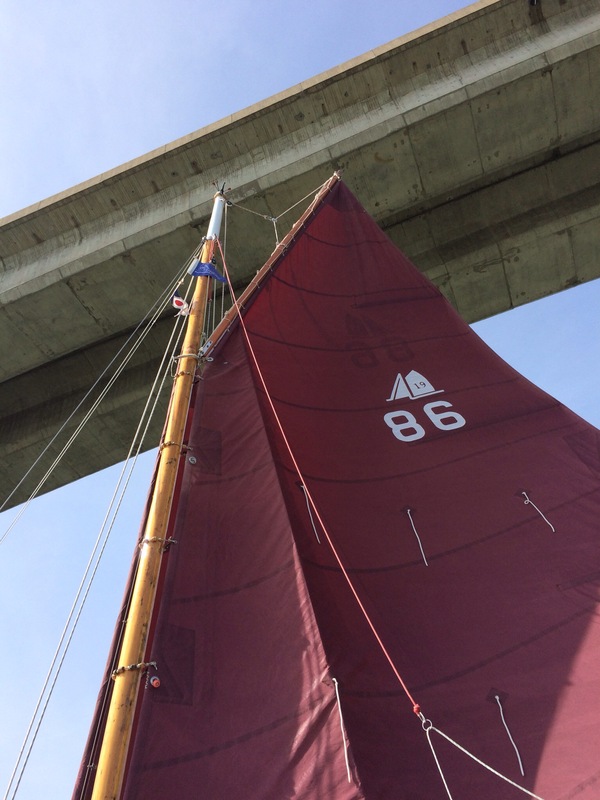 We made good progress with wind and tide both behind us, and raised double-reefed mainsails in the lower reaches just above the docks. We then made fine progress out of the harbour on the sea, looking for the safe water mark at the head of the channel into the Walton Backwaters. The Cape Cutter sails really well with staysail and refused main, feeling stable and balanced. We were making over 4kts over the ground and the occasional really big gusts did not overpower us. We made a fine sight in the bright sun, against the green sea, blue sky and scudding white clouds. Secret Water (as Arthur Ransome called it) is a good name for the Walton Backwaters, as the entrain is not obvious from the sea and a great deal of the wide area of sea is very shallow, even for a Cape Cutter, as we found out. In places there is only a narrow channel between the buoys and at one point I strayed to far to the edge. The first I noticed was the gentle scraping sound of the centre plate dragging on the sand. The plate is easily lifted, but tacking back into the channel was more difficult, so I ended up using Mr Honda to escape my irons. We awoke to a bright but breezy morning. The wind was against the tide, so the Aurora was not sitting comfortably on the mooring. It was pleasant to have a leisurely start to the morning, sitting in the cockpit, watching the goings on. Eventually we set off downwind and with an ebbing tide and reached the confluence with the Orwell in good time. As the tide was still ebbing, we dropped anchor just above the docks and enjoyed some lunch. 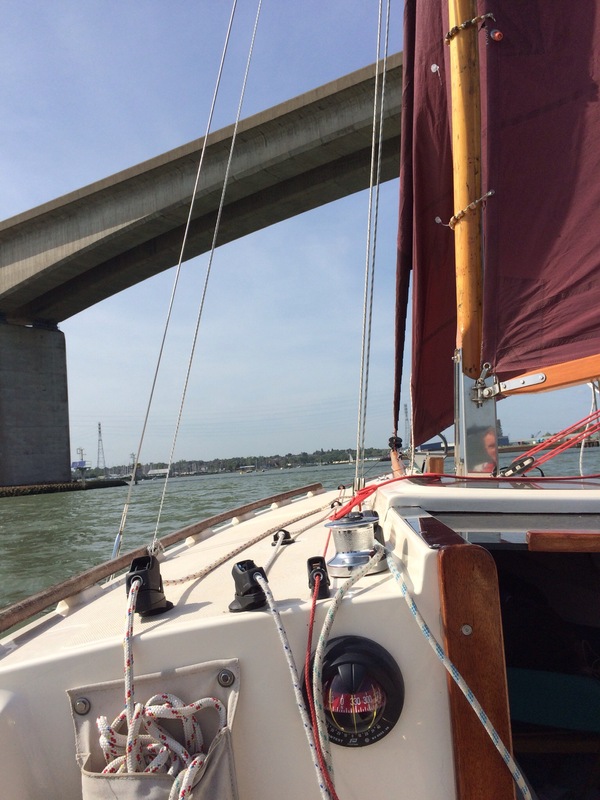 We then had the rising tide with us to sail up the Orwell to the Royal Harwich Yacht Club. The winds are always flukey through the trees and it gradually became a beat up the river. On arriving at RHYC, we Cape Cutters were rafting two deep and we managed nine boats in all. 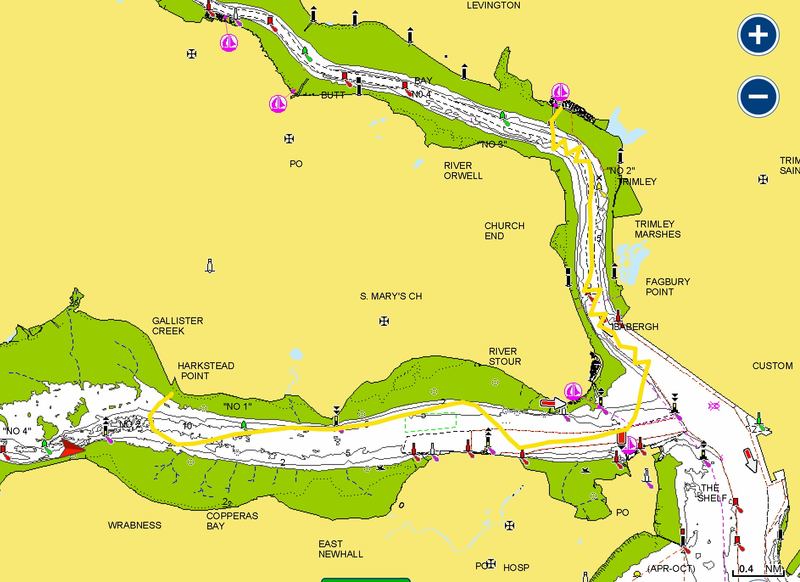 After a quick chat with Gordon Sutton of RHYC, a course was agreed and, though the tide height was not helpful, we did have a windward-leeward course. This was the first time that Cape Cutters had raced together and it was great to see so many boats together. The race generated a sense of excitement; Niki helmed Aurora and Alice asked to be on the crew too, a welcome addition. We made a very good start in the race and were at an advantage, as we were flying a Genoa, rather than the smaller Yankee which all the other boats used for their third sail. However, we did not take enough heed of the foul current in the channel and other boats sticking to the shallows at the edge had better boat speed. Nevertheless, the racing was quite close and everyone seemed to enjoy it. Let’s hope this is the beginning of a tradition. 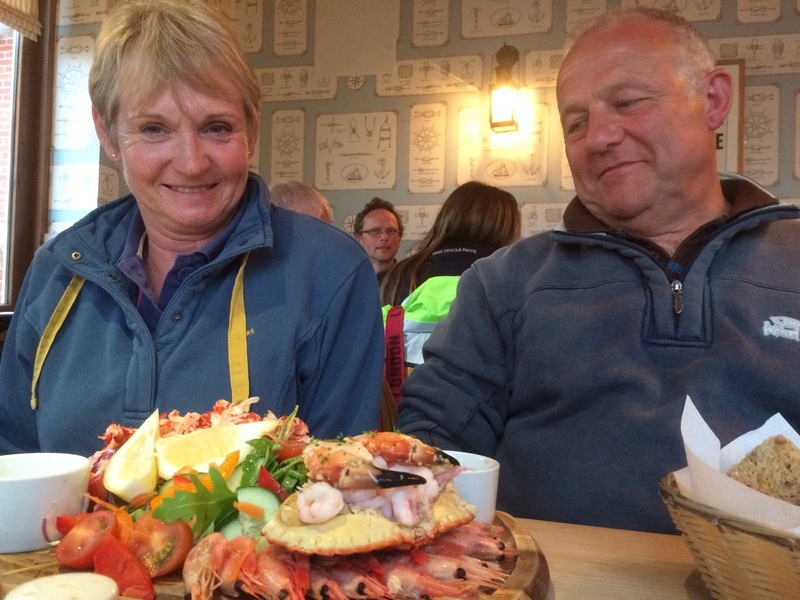 We then retired to the RHYC club house for debriefing over Adnams beer, followed by our Class Association meal- we had fifteen boats represented, with at least two potentIal owners present, as well as Bob Brown, owner of Honnor Marine, who build the Cape Cutters. After the meal, several of us gave a short presentation on interesting cruising grounds for the Cape Cutter; Scotland, Dorset, Holland and, in my case Sweden. A long and enjoyable day, followed, by a sound sleep! The fleet took in a new river today. 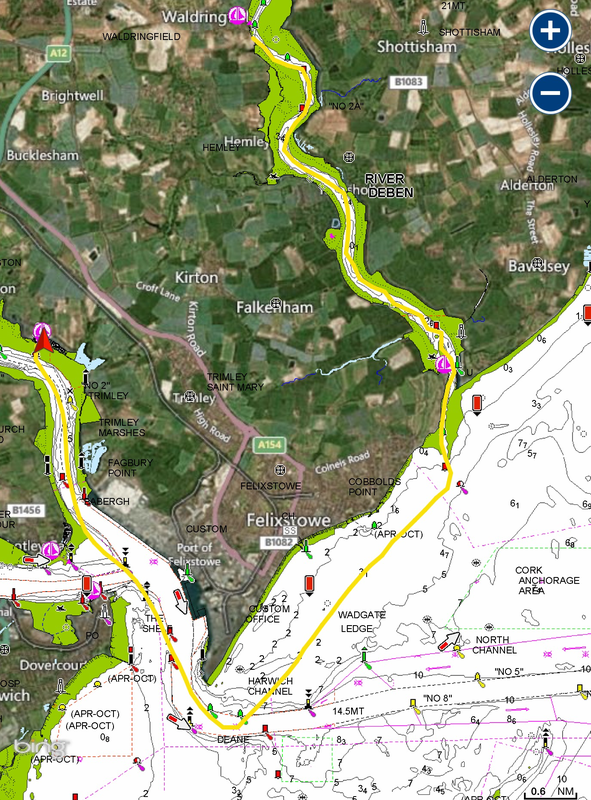 The river Stour joins the Orwell near their combined estuary between Felixstowe, with its massive container port and historic Harwich, home to many of the support vessels which shepherd the visiting container ships. 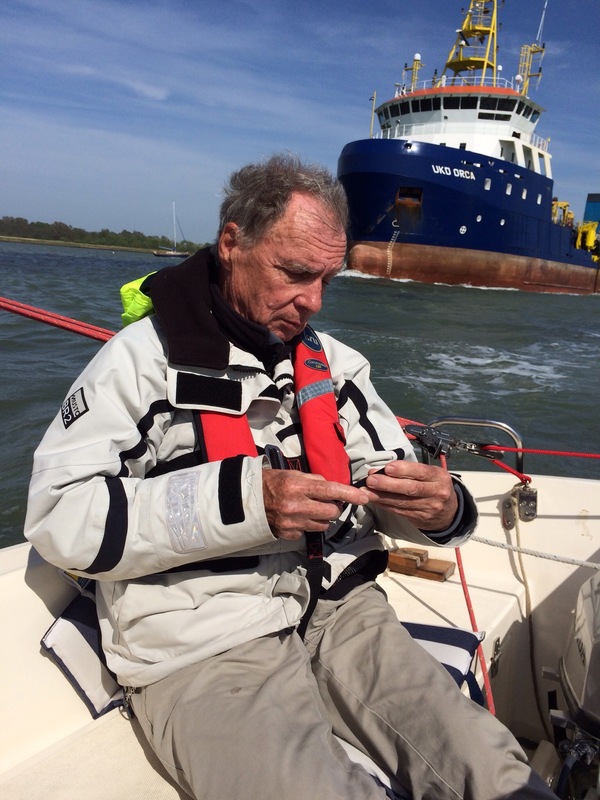 The weather was fine and warm, but the winds light and from the West, so we made initially slow progress down the Orwell against the rising tide. There was sufficient water to cut some of gone corner at Shotley. We were glad of the Genoa on Aurora; the other boats in the fleet carried Yankee fore sails instead and we benefitted from the extra sail area in the light breeze. 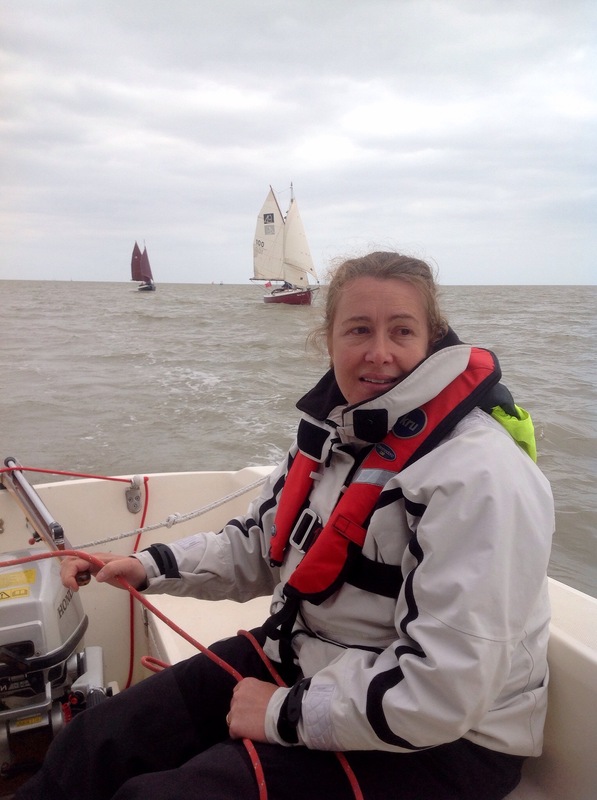 As we entered the river Stour, we were dead downwind, so the breeze seemed to fade altogether, but we made 3 knots even so, assisted by the tide. The upper reaches of the Stour contain a RORO ferry port on the Harwich (South) bank, but this quickly gives way to lovely countryside. As we slipped upstream, we could see the wide Holbrook Bay, overlooked by the impressive building of the Royal Hospital School. At this point, the fleet was well spread out and progress was slower than I had hoped. My original target had been Stutton Ness, which has a lovely sandy beach. However, we had a barbecue planned and I could see sand shining on the shore of Harkstead Point, so decided that would make a suitable alternative venue. We dropped anchor in the shallows and pumped up Aurelia. Aimee did stirling work shuttling people and equipment ashore. We had three tenders between 8 boats, so it took a while to get 19 people ashore. It was a lovely evening and we admired the anchored boats in the evening sun while we munched on burgers and hot dogs cooked by Niki. Technically, this might have been the largest gathering of Cape Cutters so far, because in addition to the 8 at anchor, two more are berthed at Holbook Creek round the corner and another one has its home mooring at Wrabness opposite. 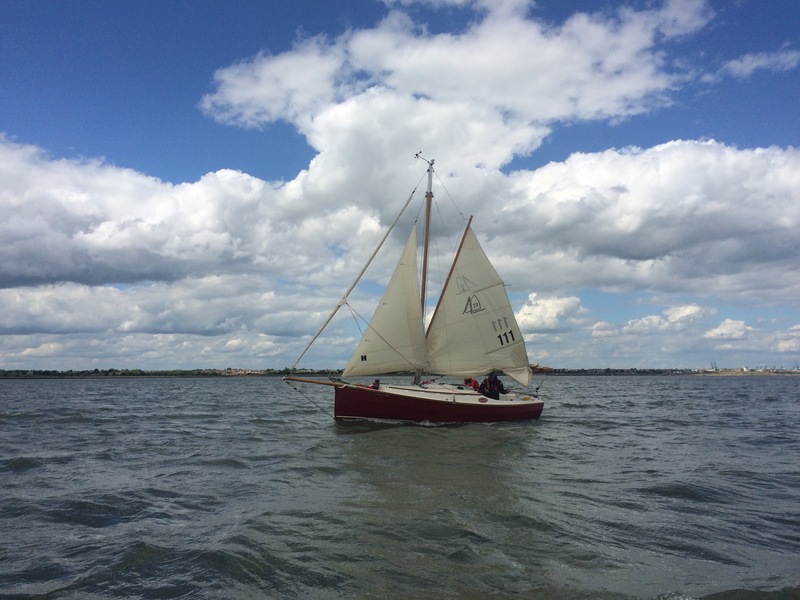 However, on of the Holbrook boats, Enigma, was not on its mooring, but had taken the morning tide and made its way up to the Royal Harwich Yacht Club, in preparation for our race tomorrow. Sadly the skipper of the other Holbrook boat was unwell and unable to join us. The falling tide forced us to carry out another dinghy shuttle, so we could move the boats out to deeper water; we took moorings at Wrabness and passed a breezy but uneventful night. We made a leisurely start on Monday, as we had to wait till after lunch for the correct tide to leave the Deben. 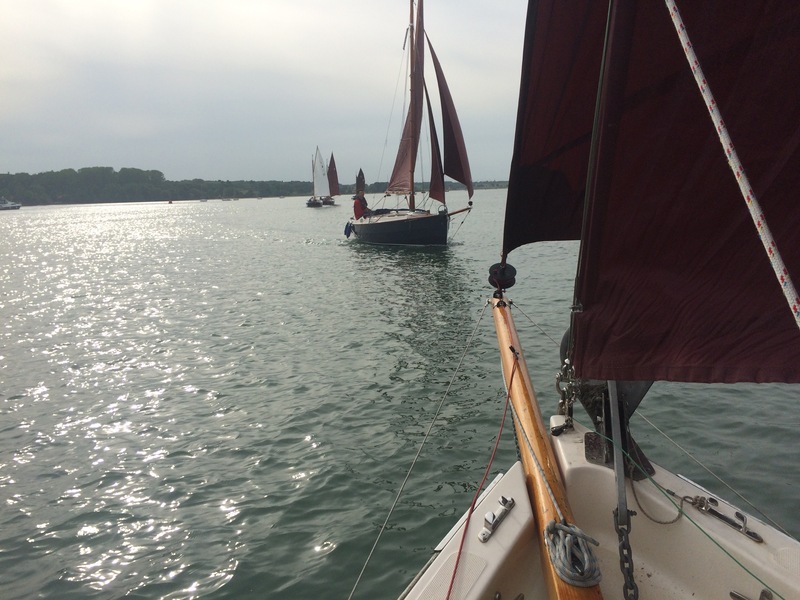 We were grateful to be offered use of the facilities of Waldringfield Sailing Club and in addition, several of the group took advantage of the excellent breakfasts at the Maybush pub. This being a bank holiday, there quite a lot going on in the village. The activity on the water was not limited to boating, with numbers of swimmers braving the chilly water and even a group of children apparently mud bathing. The seven boats making their return to the Orwell rode the last of the ebb back for a very pleasant downwind sail down the river to Felixstowe Ferry, where we had lunch and waited for the incoming tide to provide enough water to leave the estuary. The harbour master was very interested in our boats and asked us if we could provide a parade of sail as we left, something we were very happy to do. So it was, we sailed out of Felixstowe Ferry, though the turbulent water at the mouth and onto the sea. 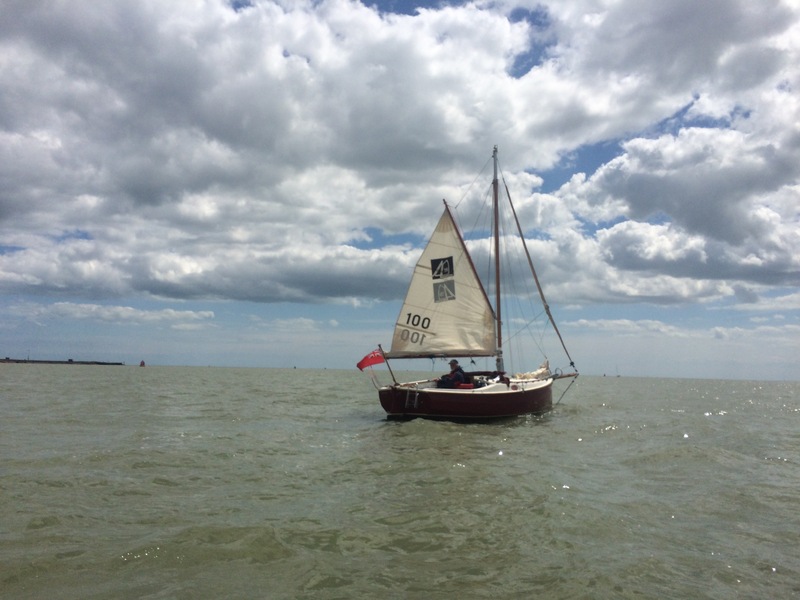 The wind had swung through almost 180 degrees, so it was a fast three-sail run down the coast back to the Orwell mouth. 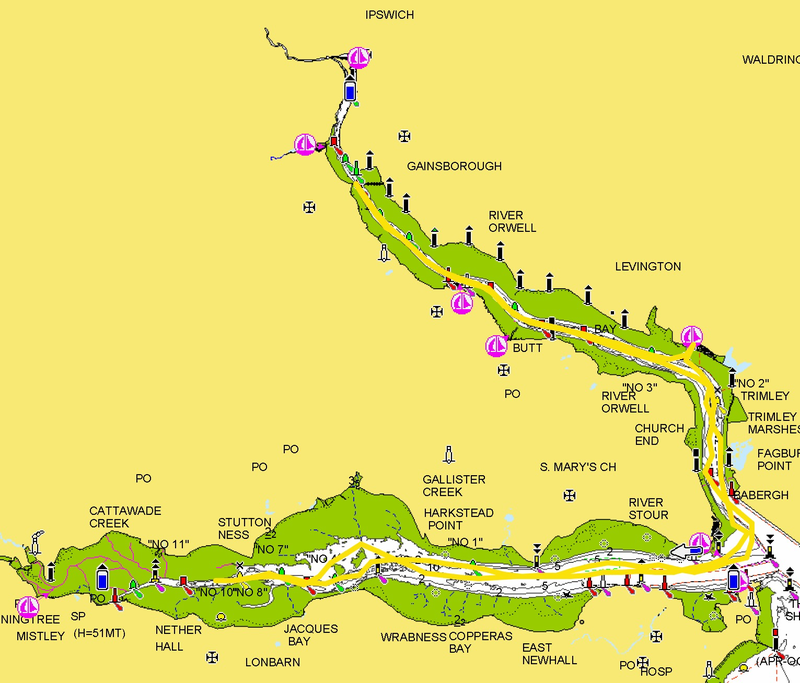 Most of us carried a reef most of the way, but shook them out as we entered the Orwell river. It was an exciting reach between Harwich and the container port, but sadly the huge ships and the cranes stole nearly all our wind at that point, so we moved rather slowly through this section. This gave us time to watch the comings and goings, including a large passenger ship departing Parkestone quay for Portugal. 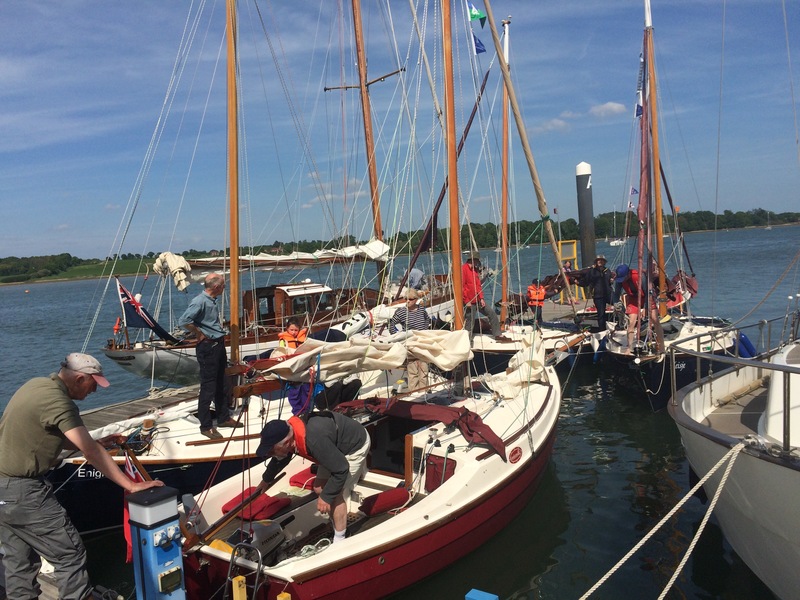 This second annual gathering of Cape Cutter 19’s is taking place on the Suffolk coast and rivers. Having spent Saturday at Suffolk Yacht Harbour getting five boats launched, to add to the two already intend water and a local boat which came to join us, we already had the largest ever gathering of this type of boat. 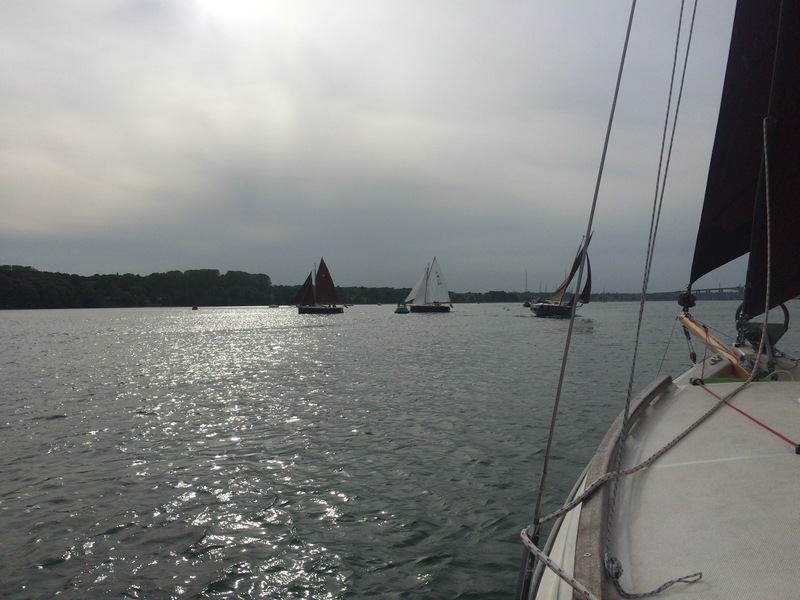 Our first cruise was from SYH at Levington on the Orwell to Waldringfield on the Deben. So it was that 8 boats (Aurora, Mary Ann, Ladybird, Halcyon, Sapphire, Samphire, Meisje and Irene) took the last of the ebb down the Orwell and beat through the river mouth. The boats made a fine sight, comprising red, white and blue hulls, tan and white sails, UK and South African-built boats. The weather was fine, with a SE F3. We made excellent progress on main and staysail, though others had Yankee too. Once onto the open sea it was a brisk run to the safe water mark at Woodbridge Haven. 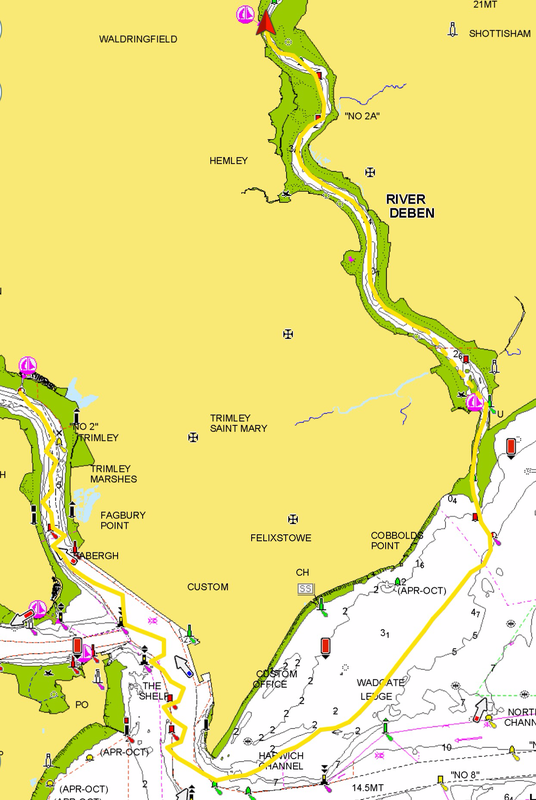 We dropped our sails and motored into the Deben mouth carried in by the flood. With the wind in a favourable direction, many of the others kept their sails up through the entrance. At Felixstowe ferry, we picked up moorings and had lunch. During this time, we were joined by a local boat Bella Mia, whose owners had only days before launched the boat for their first time. 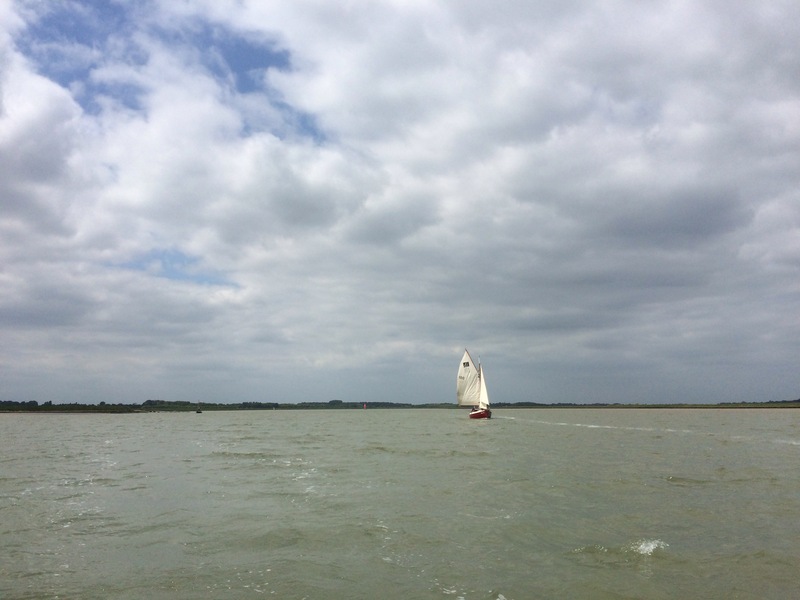 Our lunch break was punctuated by a rain shower, but it passed quickly and slipped the mooring and moved up the river Deben on staysail only, with both wind and tide behind us. This was a very leisurely passage between fields and trees through the beautiful Suffolk countryside. As we passed Ramsholt, we were then joined by another local boat, Capers and history was made, as the gathering of Cape Cutters passed double figures and ten boats sailed together along the river. 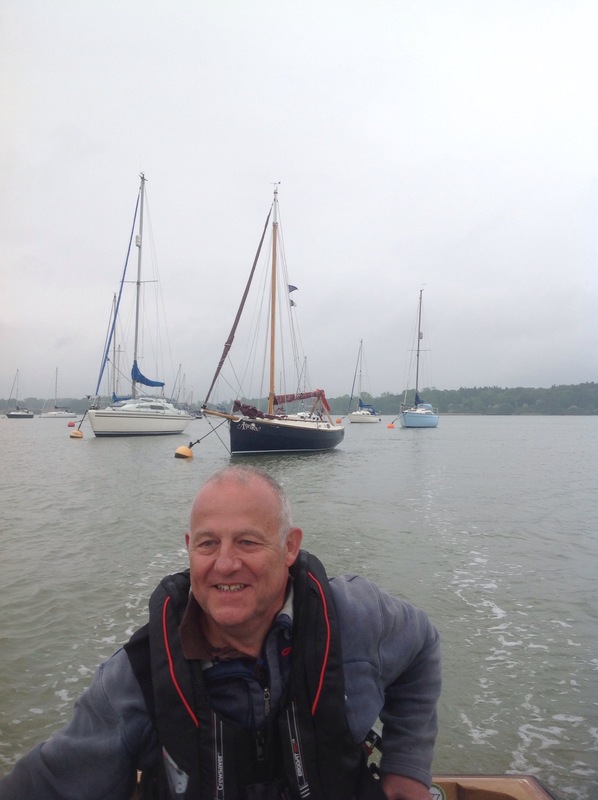 We soon arrived at Waldringfield and were shepherded to moorings by Mark Barton the friendly local boatyard owner, who also lent us tenders to row ashore. 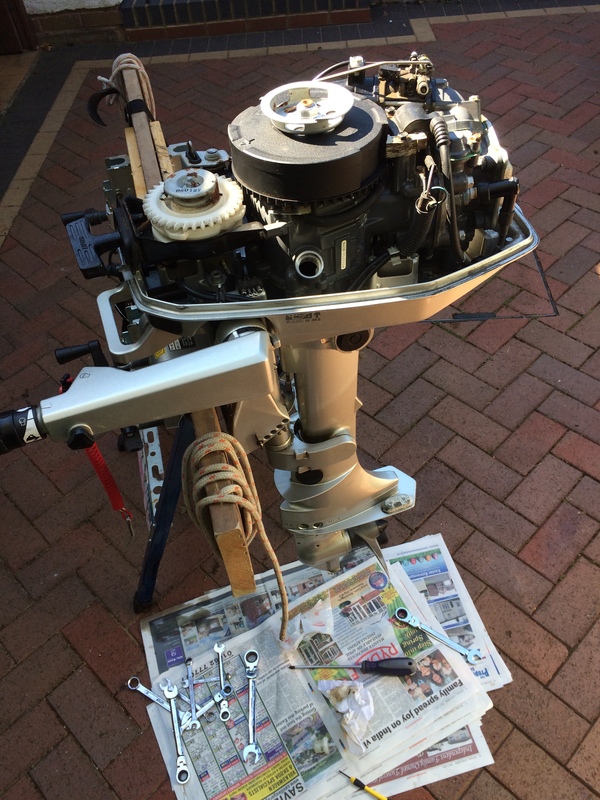 The trip was easy enough at that time, as the tide was high and the was no current, though we cheated and accepted an offer of a lift on Bella Mia’s tender, which is equipped with an outboard. We had a most enjoyable evening in the waterside Maybush pub, which was concluded with an interesting row back to the boats. We had two tenders shared between the nine boats on which crews were sleeping, and the tide was ebbing fairly swiftly at that point in the evening. 17nm travelled at and average speed of 3.5kt. The tides were on neaps, so the low tide was not especially low, but my curiosity to see the N shore of the river was rewarded with a few scraping sounds to remind me how shallow the water is, despite its wide expanse. Fortunately, with a quick lift of the plate and a course correction, we easily got back on course. 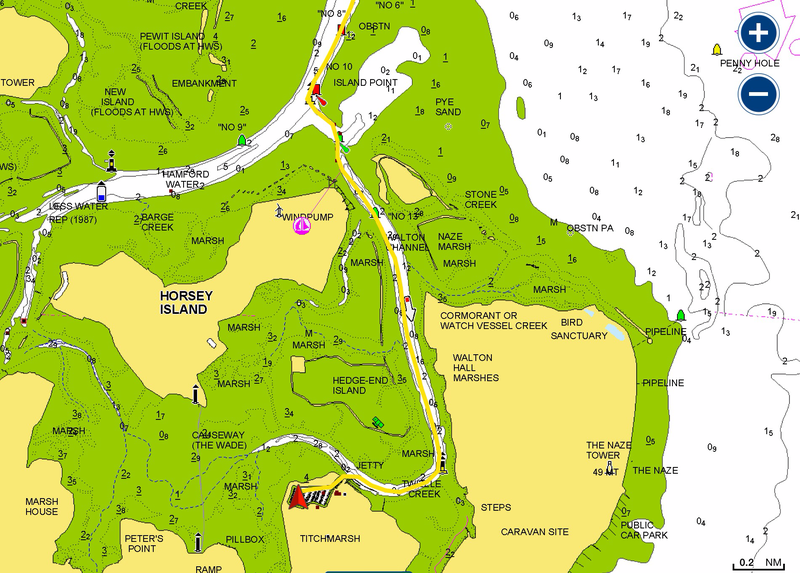 We passed Wrabness, but decided not try for Mistley, as there is nowhere to go ashore, and there definitely was not enough water for Manningtree. So it was we borrowed a mooring back a Wrabness and enjoyed the emerging sun whilst we had lunch. There still seemed to be plenty of time, so we returned in the somewhat more lively and gusty conditions back towards Harwich. We raced a trio of shrimpers, which was interesting; I did not use the genoa as the furler was jamming, and when there was plenty of wind, they could not catch us. However, when the wind dropped down, we became underpowered and the shrimpers caught us up. The turned into the marina and we made our way back up the Orwell. By now the tide was rising again and the wind right behind us, so we flew up river and managed to avoid a gybe even though we were very deep. The day by then was very bright, sunny and warm, so we decided to press on upstream. I had the idea that we would make the Orwell road bridge just before high tide and then not have to fight the current when we returned to Levington. It was a very busy afternoon on the river, with all manner of small boats out and about. The dredger was very active too; we met it just before Levington and so I moved just outside the channel to give it room. To my shock it rotated on its thrusters through 180 degrees and proceeded to follow us back up the river! This was a bit disconcerting as we had little room for manoeuvre sailing almost dead downwind with shallow water either side and lots of moorings and traffic to avoid. We reached the impressive high road bridge in good time and almost immediately turned about to reluctantly return to base. A few tacks were needed initially, but soon we were on a fetch down the river, alternately using the strong gusts to lift us when we needed to or else easing the sheets and taking the acceleration. The tree-lined shores seemed to offer the more gusty conditions but it was most enjoyable to watch the woods and fields slip by. By the time we reached Levington, the wind had freshened considerably, the sails were dropped and we picked up our berth in the marina once more. Although this had not been a passage as such, it had been a lovely day’s sail and we clocked up 30nm and averaged 4kts overall.